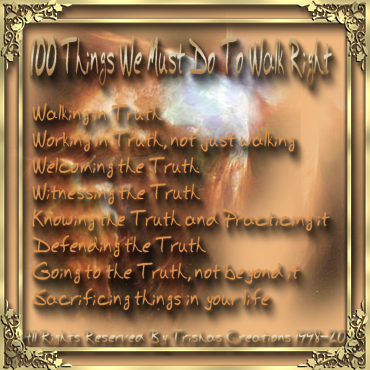 "101 Things We Must Do To Walk Right"
Welcome to "101 Things We Must Do To Walk Right"
A lot, of us wonder what all we need to do, in order to do all we can to be the Best we can. Here’s some things that will help you get a head start. If, we practice everyday and show other's to do the same, you'd be surprised as this can have a serious impact on the world and those around us. It's not hard, most of us do these anyway, but some do not and it will help each and everyone climb closer to the throne of God and become a better person and follower of Jesus Christ! Worship God, in music, praying, etc.